As I will say over and over, ADA makes some amazing aquariums. Again, ADA aquariums are worth every penny. Unfortunately, as all of us people in the US find out quickly, they just don't fit quite right into the American standard stands. 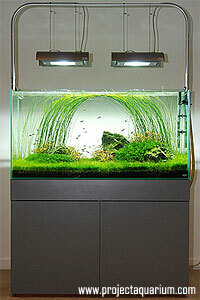 ADA aquariums are measured using metric. I picked up an ADA 120H in 2007 and after some immediate searching, it was clear that I would have to get a stand that was made to handle metric measured aquariums like ADA aquariums. While the prices of the ADA aquariums are worth it, I do believe the stands are like most of the ADA line, over-priced. I was left with having to build an ADA style aquarium stand. Here I will go through the steps I went through to create this ADA style aquarium stand. It took me about 40 hours to build this ADA style aquarium stand. I think the final product ended up much better then I envisioned, and I may be so bold to say that it is even nicer then the true ADA equivalent. Each picture below can be clicked to view a larger version. - The remaining piece of 3/4" was used for the doors and riser. - 2 pieces of 8x4' Formica - so many colors to choose from!! NOTE: Formica is VERY SHARP when it is first trimmed. I cut myself more then I would like to admit. Be careful!! Glue and Screw - Use the 1.5" pieces of wood to create all the sides and the center support. Glue and screw all the joins. I used the 2x2 studs to give strength. The dividing support in the stand will be cut out before glued into place. Ready for Putty and Formica - This is the stand after all gluing was complete. Notice the center brace has been cut to allow equipment in the stand. Putty and Stain - Here I puttied the seams and stained the inside for look and protection. Formica - Here is a picture of the two sheets of Formica when I brought them home. The sheets are considered 4x8' but they give you an extra 1/2" on each side in case of chipping. You can pick up Formica at any larger hardware store. Adding Formica - I added the first piece of Formica by gluing and letting adhere with some weight on top. I then trimmed it with the router. Formica is glued using contact cement. There are a few methods but they all have the same basic approach. I used this tutorial to help me. Formica on the back - The next side glued and trimmed. Formica on the Front - I used one piece to do this. I glued it to the front and then trimmed it out. This allowed for no seams in the front adding to the smoothness of design. Last Piece - One last piece to complete the cabinet!! Cabinet Complete - Now time to drill holes for the hoses. Drill Portals - Use a hole saw bit for this. It was very challenging to not chip the Formica. Some people use tape and drill through the tape, but this didn't seem to work for me. Doors Added - Here the stand is complete!! Doors Open with Tank - I was very proud!! Equipment Added - Here is a shot of the stand in use. As you can see, there is plenty of room.